← Where Would We Be Without the Earl of Sandwich? When I was first married in 1972, my (then) husband and I lived in a tiny apartment on the third floor of a three-floor walkup. The miniature kitchen had a dollhouse sized stove and fridge and a muffin tin would completely occupy all of the counter space. The cupboards were shallow, tiny and scarce. 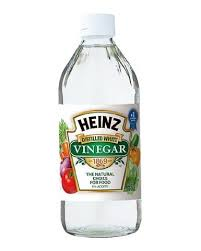 Money was also scarce, so I started marriage on a lean budget for kitchen supplies. 1972 was the era of Bundt cakes, pet rocks, mood rings, fondue, miniskirts and leisure suits. Even McDonald’s famous Egg McMuffin didn’t come on the market until late 1972 or early 1973, although we could never afford to eat out anyhow. Fortunately our respective parents frequently invited us over for dinners. 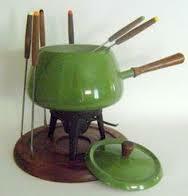 The first crock-pot came on the market that year, and although I didn’t have one until years later, I was given a fondue pot as a wedding gift (avocado green, of course). I still have the forks, but the pot is long gone. Looking back, though, I had the “essentials” that every wife of 1972 should have in her first abode: salt, pepper, ketchup, mustard, mayo, oleo and a few boxes of Jell-O. You know, the staples. A few cans of Campbell’s soup, tuna, spaghetti and Kraft Dinner were clustered in a corner cupboard and there was always a package of hot dogs in the freezer. My mom bought IGA dried spaghetti. I thought that was the only kind of pasta there was! (Photo Credit: www. At the time, I could go to the local supermarket and get 8 boxes of Kraft Dinner for $1.00 Canadian, so we learned to love it. There was always one box of cereal, a bottle (yes, bottle) of milk, and the ubiquitous Hostess sliced white bread. We both worked and both took lunches to work daily (does anybody take a lunch to work anymore?) If, at the end of the month, there was a little cash left (and there usually wasn’t), we would alternate months by splurging and buying a mickey of rum or rye (for non-Canadians, a mickey is a pint). He liked rum and coke: I liked rye and ginger. We would pour one only on a Saturday night and savour every sip. In 1972, I could buy 8 boxes of Kraft Dinner for $1.00 Canadian ! (Photo Credit: www. 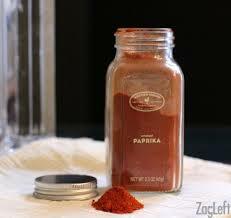 Other than salt and pepper, the only “exotic” spice I had in my kitchen was paprika. That was it. Someone gave me a set of spice jars in a rack for a wedding gift, but the jars were empty and I couldn’t afford to fill them up. Besides, I didn’t even know what to do with most of them. I was a tabula rasa in the world of cooking. The salt of my youth (Photo Credit: http://www.freerepublic. 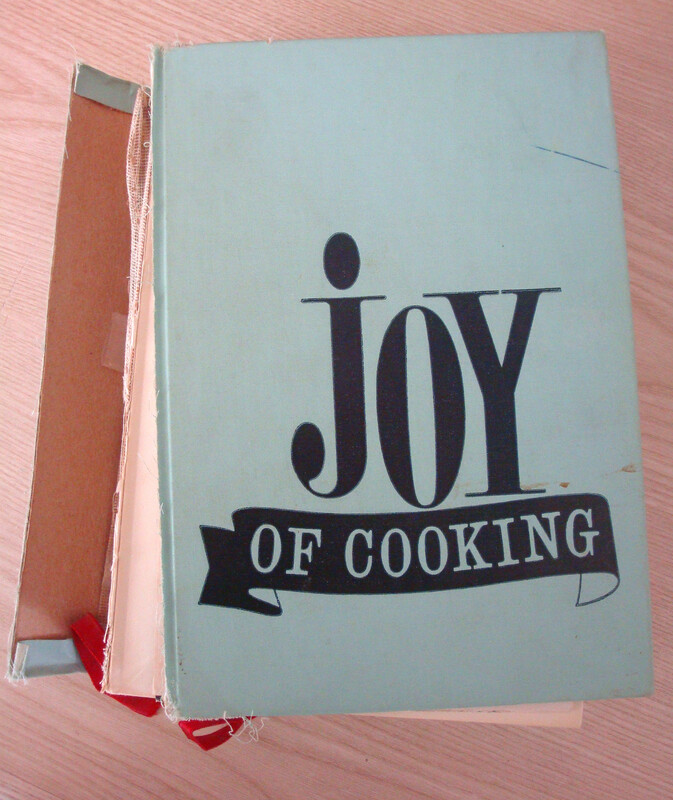 I was given a copy of “Joy of Cooking” by Irma Rombauer as a wedding gift, which I still have to this day, although it is rather sad-looking. 1972 saw a lot of cookbooks introduced to the cook including The Galloping Gourmet, Pearl S. Buck’s Oriental Cook Book, James Beard’s American Cookery, The Cuisines of Mexico by Diana Kennedy and many more. I have copies of all of these cookbooks in my collection now and enjoy looking at the recipes of a simpler time, or at least it seemed so to me. Unbelievably, I was also given a Sunbeam Mixmaster (handheld), in another one of the classic 1970’s colours, “harvest gold” and I not only still have it, but I still use it after all of these years. They don’t make em’ like that anymore! Takes a licking and keeps on ticking. Fast forward to my kitchen pantry of 2015. Although I have always loved to cook, the availability of goods from the global marketplace has enabled me to purchase and sample an infinite variety of foods, spices, appliances, cookbooks and everything food related. So much so, that I just take it for granted that I can nip down to my local grocery store and pick up not only the basics, but can select from dozens of kinds of olive oils and mustards, salts, pastas, herbs and much more. All just in the average supermarket. Wow! 16 varieties of hot (really hot!) sauces, ranging from “Slap Your Mama” to “Death Wish” There was no hot sauce in my mother’s kitchen, when I was growing up nor anything even resembling it. 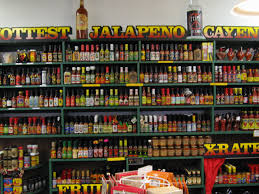 I didn’t buy hot sauces until I was in my 30’s and began buying cookbooks and experimenting with “global” cuisines. I have since developed a strong affinity for hot and spicy sauces, having been deprived of them in my youth (I’m making up for lost time). 65 varieties of salts from around the world. 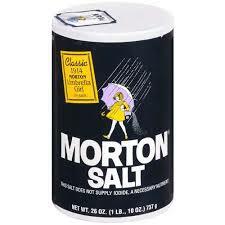 “Salt” in my childhood home was Morton Salt (you know, when it rains, it pours) and that was all there was for sale in the local IGA my mom shopped in. 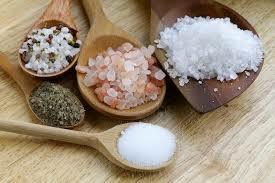 Some of the salts in my 2015 pantry (Photo Credit: http://www.vegkitchen. Now, I have the luxury of pulling out a salt from my collection, say, Peru, and picking a recipe from one of my Peruvian cookbooks to build an entire meal around it! I also have 7 different varieties of pepper. I’m not sure of the exact count, but suffice it to say that I have in the neighbourhood of about 45 kinds of herbs and spices, perhaps more, which I use all of the time. 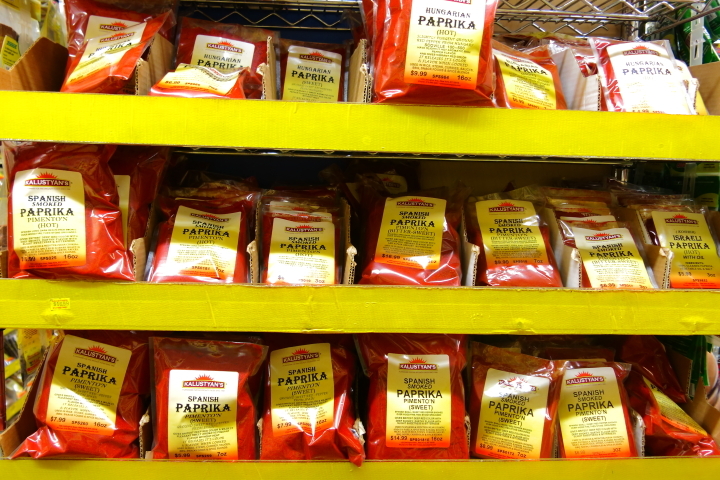 In 1972, my “exotic” spice in my kitchen was paprika: now I have 6 varieties from Spain alone, a couple from Hungary, etc! How cool is that? As a kid, my mom always had one of those little plastic bear shaped containers of honey in the cupboard (I seem to recall that it was mostly used to be mixed by my Dad, with lemon juice and poured down my sore throat). I still have one of the little bears filled with honey, but I also have agave syrup, and 4 or 5 varieties of honey, which differ by what flowers the bees were pollinating. In 1972 and for many years after that, the only beans I ever ate or cooked with came in cans, and although I still use some of them, I have grown up and starting cooking beans “from scratch”. 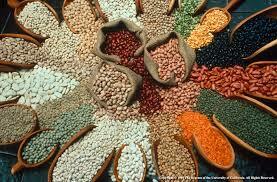 I currently have about 20 types of dried beans, including some of the ancient strains and heirloom beans. Such luxury! 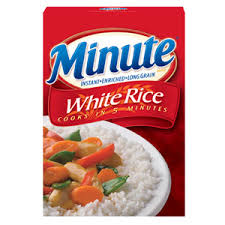 In 1972, following my Mom’s lead, I cooked “Minute Rice”, mostly because it was the only rice around at the time in the grocery store. There were very few “ethnic” stores in our neighbourhood and surroundings, so the IGA was pretty much it. 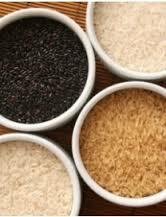 Now, I can buy jasmine rice, short grain, long grain, brown, Arborio, black, red and many others too numerous to mention. At any given time, I usually have 4 or 5 kinds in my pantry. Pasta? Spaghetti was it in 1972. I have 11 different kinds in my pantry now, and I use them. The diversity in shapes is awesome, as well as flavour. 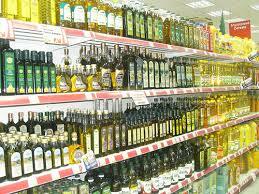 Oils? No more just corn oil and plain vinegar: I have avocado oil, truffle oil, green chile oil, jalapeno oil, rice bran oil, etc. 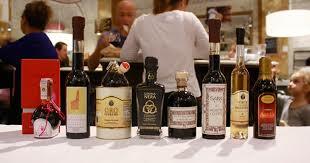 and several kinds of white wine vinegars, balsamic vinegar, pomegranate vinegar, cider vinegar, lemon vinegar and others. So many vinegars to choose from for my 2015 pantry (Photo Credit: http://www.seriouseats. Of course, I might have a wee tendency to excess, when it comes to food and cooking. After all, this is the person with 4,649 cookbooks to her name. So, has all of this easy access to the global palate made me jaded about buying food? Perhaps. The more that is available, the more we come to expect and demand it. On the other hand, having grown up in an era when we ate pretty much a meat and potato diet, I do appreciate the incredible diversity and easy access we have to foods from every reach of the globe. Is it decadent? Absolutely, but I make no apologies for it. Who knows what my pantry will look like in another 10 years? This entry was posted in Cookbooks, Cooking, Cooking and Social History, Cooking Technology, Eating, Food Trends, Uncategorized, Vintage Cookbooks and tagged 1972 Kitchen, cookbooks, Cooking, Fondue Pots, food history, Irma Rombauer, Kitchen Appliances, Kitchen Gadgets, Kraft Dinner, Sue Jimenez, time capsules, TV Dinners, Vintage Cookbooks. Bookmark the permalink.